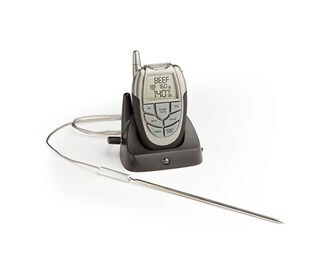 The Cuisinart CSG-700 is a wireless grill thermometer that is perfect companion for any griller. You can monitor the grilling temperature of 6 different types of meat (beef, veal, lamb, pork, chicken & turkey) from up to 100 feet wirelessly. Choose your meat and cooking level, insert the probe, and grill away. 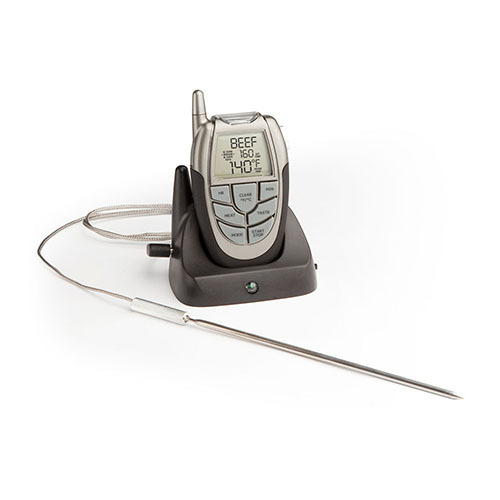 The handheld unit will monitor the meat temperature and even alert you when it's done. The thermometer also has a convenient timer and built in flashlight for grilling any time of day or night. The pocket-sized unit also comes with a belt clip for easy transport. The Cuisinart Wireless Grill Thermometer has many exciting features for users of all types. You can extend the lifetime of your Cuisinart Wireless Grill Thermometer with the purchase of a FactoryOutletStore Factory Protection Plan. See the Cuisinart Wireless Grill Thermometer gallery images above for more product views. The Cuisinart Wireless Grill Thermometer is sold as a Brand New Unopened Item.